The matchstick buzzer is simplicity in itself and an awesome fly for both reservoirs and stillwaters. The pattern is a very basic buzzer and gets its name from looking like a match with slim body and rounded head. 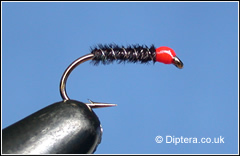 There are numerous colour combinations for this fly but the most common are black or claret body and heads in fluo green, fluo orange, red, pink or yellow. I tend to like wide gape hooks for this pattern in the larger hook sizes, I believe they aid hookups. The rib can be wound in tight or spaced out turns, I usually make sure I have a few different rib variations in my box.